Over the last 30 years, Malaysia has miraculously grown into a middle income country, transforming itself from a primary producer of minerals and commodities, to a multi-sector economy. The Malaysian Government has skilfully attracted foreign investment in high technology industries like electronics, multimedia, medical technology, and pharmaceuticals, service sector industries like Islamic finance, and urbanized the country with a rich retail service industry. However, agriculture has been allowed to slip well behind the rest of these sectors within the economy. This is normally the case when an economy transforms itself from the status of ‘developing’ to ‘developed’. However the case of Malaysian agriculture characterizes a number of mistakes. These mistakes have cost the country in terms of better food self-sufficiency, rural and community development, regional development, employment, poverty alleviation, and missed some of the great agro-based sunrise industry opportunities of this millennium. What more, rural infrastructure and agro-based expertize is drastically lacking in Malaysia, since the Mahathir led drive to modernization back in the 1980s. This is particularly dangerous with a gloomy global outlook ahead, where Malaysia must become buoyant enough to internally withstand any deep international recession approaching, if it is to stave off great hardship on its citizens. According to Malaysian statistics cited over various Malaysian Plans, the agriculture sector in 1970 represented 28.8% of national GDP. As of 2013, agriculture represented only 9.33% of GDP. However in some states like Perlis, Kelantan, and Sabah, agriculture still makes up 20-30% of the total economy. Employment in the sector has fallen from 13% of the total workforce in 2007, to only 9.3% in 2014. However 66% of the people involved in working within the agriculture sector are over 50 years old. The estate sector is primarily staffed with foreign labourers bringing little income benefits to local communities. The bulk of Malaysia’s agricultural land is utilized for the production of industrial crops, which has risen from 2.1% in 1960, to over 87% of land use today. Palm oil and rubber dominate, with paddy production and declining cocoa production running far behind. Timber is still a major primary product, where reforestation is lagging behind, making the industry unsustainable. Sarawak for many years has enjoyed a successfully developed a pepper industry, and there are pockets of fruit and market vegetables, around the nation. However, less land is being utilized for agriculture today, as it is more valuable for industrial and housing developments. The composition of industrial crops, and industrial and housing development for land is steadily driving up the costs of food production in Malaysia. Paddy farming is also facing challenges due to declining productivity, increasing fragmentation of land plots, and poor response to changing consumer desires within the marketplace. Even the production of palm oil is expected to decline based upon recent industry predictions. The push to industrial crops in the 1960s although rapidly developing the agricultural sector, rapidly decreased the diversity of agriculture within Malaysia. Even settlement schemes like FELDA and FELCA shied away from food and cash crops towards the palm oil and rubber because of the relatively large returns available with little need to market and sell their crops. As smallholder farmers have aged, with the youth reluctant to follow in their parents’ footsteps, the production of crops such as coconut, tropical fruits, vegetables, and other cash crops has been declining. Estate production of industrial crops is now the mainstay of Malaysian agriculture, which is mainly in the hands of Malaysian Government Linked Companies (GLCs) like Sime Darby. Smallholders have been grossly neglected where little has been done by Malaysia’s agricultural research institutions and universities to modernize and develop appropriate technologies, new hybrids of cash crops, and assist in developing modern smallholder business models through the infusion of entrepreneurial thinking in rural communities. In addition, finance for smallholders is extremely difficult to obtain, and farm extension has all but died out two decades ago. The smallholders have been left to themselves, where they face acute labour shortages and little access to markets that would help make their efforts viable. If one also factors in poor basic infrastructure such as access to irrigation and roads, the poor level of education of most smallholders, resulting in an attitude towards being production orientated rather than entrepreneurial, “conmen” taking advantage and promising big returns to smallholders if they buy seeds from them, and the condescending attitude many government bureaucrats have towards small holders, it’s not hard to understand why this sector is so much in decay. The Malaysian agriculture situation has reached a point where the estate business model that was once so successful for the production of commodity crops is now stagnating. Malaysia is losing its dominance as the major producer of palm oil, and palm oil itself is under threat from international health concerns, and also concerns from the international community about the environmental record of Malaysia’s palm oil producers. Rubber prices are facing a slump, and paddy production is primarily insufficient to feed the total population, i.e., 35% of Malaysia’s rice needs to be imported from Myanmar, Thailand, Vietnam, India, and Pakistan. There is little evidence to see where local communities have benefitted from the presence of Malaysian GLCs, yet state Governments have been eager to transfer state land to them for development with virtually no transparency. Picturesque pieces of virgin jungle are still being ripped up to make way for new palm plantations, to replace those developed into housing and industrial estates, where the GLCs are making mega-profits. Malaysia’s agricultural direction was planned through a series of 5 year plans. The Malaysian political/bureaucratic elite have always presented rosy forecasts and gained publicity through staging MOU ceremonies, to announce projects which never happen, or fail through mismanagement. Part of the problem in the Malaysian agriculture sector is that the politicians and bureaucrats have been thinking big, at the cost of thinking small. For example, the Ministry of Agriculture has developed a list of agro-based industries that should be national priorities. The Malaysian Agricultural Research and Development Institute (MARDI), and the Forest Research Institute of Malaysia (FRIM) restrict their research to these national priorities, while leaving a void in research on crops needed to spur on the growth and development of small local communities. Consequently, Malaysia’s research efforts have benefitted few communities, which still remain in relative poverty today, particularly in the agricultural dominant states like Perlis, Kelantan, Sabah, and Sarawak. There are a lot of potentially viable crops that should be researched and developed, but are being ignored. Institutions like MARDI and FRIM have become showpieces to please the politicians. Further, the bureaucrats involved in these plans implementation have appeared to lack the zeal and commitment to see these plans progress into reality. Managers on the ground have focused upon building hard infrastructure where favoured contractors can be employed to build these projects and facilities, rather than ploughing resources and money into education and extension. The result has been a number of ‘white elephants’ that litter the country. Corruption, via land grants, misallocation of funds, and building irrelevant facilities, is a major issue hampering effective rural development in Malaysia today. Malaysia, as an economy skewed towards state planning and intervention has attempted to “pick winners” and develop them through the state apparatus. In the case of herbs and biotechnology, massive funds were allocated in the pursuit of achieving success in these “sunrise” industries, where the funds were predominately channelled into developing ineffective and costly bureaucracy. The Malaysian Herbal Corporation was formed in 2001 with much fanfare, where it was considered within the bureaucracy to be the driver and ‘flagbearer’ for the industry. The corporation undertook many initiatives, with the staff travelling widely and luxuriously around the world. Today, the Malaysian Herbal Corporation is now defunct. With former Malaysian Prime Minister Abdullah Ahmad Badawi’s focus on biotechnology as a ‘sunrise industry’ midway last decade, the Malaysian Biotechnology Corporation (MBC), along with various state funded biotechnology companies such as Melaka Biotech, J-Biotech in Johor, K-Biocorp in Kedah, and Kelantan Biotech, were all well-funded with hundreds of millions of Ringgit in grants, but have little, if anything to show for it. Most of, if not all of the grants given out by MBC to commercial companies failed to produce any commercialized intellectual property, as university research also failed to do. Technology Park Malaysia (TPM) built biotech labs around the country in places like Perlis, which are mostly empty. The East Coast Economic Regional Development Council set up herbal parks in Pahang and Terengganu which are basically inactive in regards to their original purpose. FELDA opened up the FELDA Herbal Corporation which is now replaced with another attempt at developing biotechnology through Felda Wellness. Biotropics was set up by Khazanah Coropration and is basically only producing some cosmetic and herbal products. The Ministry of Health set up NINE BIO to produce Halal vaccines and herbal products. The Malaysian-MIT partnership hailed as being an example of a smart-partnership, cost the Malaysian taxpayer USD20 Million with absolutely nothing to show. The Malaysian Government rather than be a driver of the industry became a participant with drastic results. Just about all these Government interventions into business have failed dismally, losing hundreds of Millions of Dollars for the Malaysian taxpayer. What is tragic is that there has been no transparency in the way the Malaysian Government handed over responsibility to personnel within these government corporations, and no accountability. Top down planning with no consultation with local industry, local communities, and local scientists, has led to Malaysian agriculture falling well behind its neighbours within the Asian region. Top down planning has allowed bureaucracy to overrun market considerations in Malaysia’s agricultural and agro-based industry development. Development programs like the agropolitan schemes in Sabah are conceptualized and developed within the bureaucrats’ paradigms. GLCs are asked to take up large swabs of land, plant palm oil, and develop a small corridor for local villagers. They have been of large benefit for these GLCs, but local villagers have been short changed where GLCs partaking in these projects fail to live up to their responsibilities. Likewise, other bureaucrat concepts such as combining fragmented land holdings into paddy estatesrun by anchor GLC companies, as promoted by the Performance Management Delivery Unit (PEMANDU) within the Prime Minister’s Department disempower local land owners who are expected to work as labourers on their own land. These types of projects have failed in their conceptualization, let along during the implementation stage. As a consequence opportunities to alleviate poverty in rural communities have been missed, and opportunities to develop new crops, and create new industries have been ignored. Many successful programs like entrepreneurship mentorship schemes run at Agricultural Institutes around the country, are starved of funds, because of the preference for the bureaucratic ‘white elephants’ that benefit policy implementers financially. Malaysian agriculture is now in crisis and there is a need to reinvigorate the sector, particularly with the expected global economic slowdown. Malaysia is currently importing up to 60% of its current food needs. With the level of national debt, falling foreign reserves due to a low Ringgit, and a potential slow-down in exports due to a sluggish international economy, food self-sufficiency may become more important than ever. Food self-sufficiency would create an important buffer for rural Malaysia to withstand any deep recession. Without food self-sufficiency the population within the Malay heartlands will suffer immensely. As mentioned, Malaysia imports much of its rice needs, milk, beef and mutton, flour, and fruits. Within this problem, lays an opportunity. Malaysia’s Neighbour Thailand has been reinventing itself as the ‘kitchen of the world’. Malaysian agriculture with modern farming methods, utilizing appropriate technology, and adopting new branding paradigms through merging GAP and Halal practices into say a “HalalGAP” protocol could enter and prosper in the rapidly growing Halal market worldwide. Malaysian agriculture needs new farming practices, business models, and reinvented supply/value chains. The decline of the value of the Ringgit will help Malaysian farmers find a new era of competitiveness that the sector has never had. Now is the time to take this opportunity. 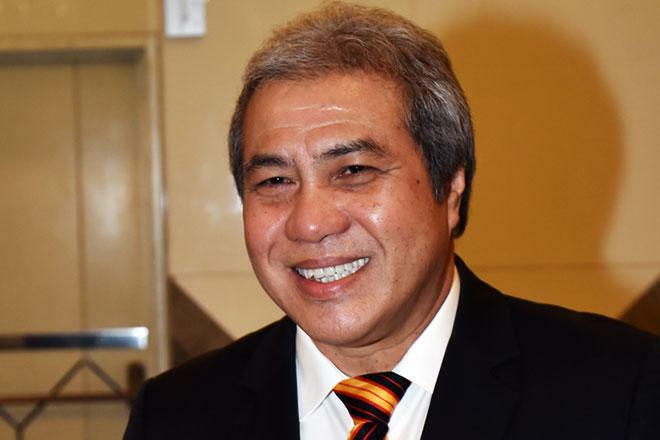 Awang Tengah, Sarawak’s senior minister, is at it again: he reportedly said he want the state govt to extend electricity coverage to the remote rural areas! Consider these facts to help you make a judgement on his sincerity: 1. In his own constituency in Lawas the electricity coverage is almost 100%; but next to his constituency in Long Semadoh where the sitting Assemblyman is from the Opposition party, the electricity coverage could be less than half! 2. The state government has been leaving electricity supply to its privatised-then-nationalised utility Sarawak Energy -which says openly that they are into profit making electricity sales-so rural electrification had been left to Federal government under the rural ministry. So has the state government just changed colour to undertake non-profit making rural electrification? Or that the state election is around the corner? The Ministry of Public Utilities plans to collaborate with Sarawak Energy Berhad (SEB) and Public Works Department (PWD) to extend electricity supply to remote and isolated areas in the state, reported The Borneo Post. Minister of Public Utilities Datuk Amar Awang Tengah Ali Hassan said he would present a paper on the initiative to the state Cabinet soon. “If the state Cabinet agrees with the proposal, then we can we proceed and let both SEB and PWD to become the implementing agencies to supply electricity to the very remote and isolated areas in the state which are not connected to the grid,” Awang Tengah told The Borneo Post after chairing a meeting with the media at his office on March 8. He said the state government’s main concern now was to look for the best solution to assist those who were still depending on generator sets which were deemed too expensive for the rural people. He added that among the possible solutions to address the situation were to provide alternative sources of electricity such as mini hydroelectricity dams and solar energy. To achieve the target, he said the government must adopt the same policy as the federal government through the National Blue Ocean Strategy (NBOS) approach to find the best possible solution. Sarawak state elections are around the corner -most likely in April. There will be 82 seats up for grab-11 more than the last time. Coincidentally or not the Opposition also won more than 11 seats in previous state elections-giving the impression that the new seats created in the rural areas are to counter the wins by Opposition parties in the urban areas! Despite or because of this and other unfair practices in election administration there is a greater need to monitor the operation of the election to keep pushing the election administration in Malaysia into a more professional and credible outlook! The claim by the new EC chairman that there is nothing unfair in the elections under EC is an abuse of the mainstream media to cover up their well-documented misconduct over the decades. They dare to do this because they can count on the mainstream media not to challenge their ridiculous and unsubstantiated claim. Their self-compliment only speak of their partisanship than anything else! We and our team of trained observers will monitor the state election to expose any maladministration this time! Keep watch over here! We are watching the state election-including the supposedly neutral referee! We will also bring to light the views from the rural interior areas so that you will have a more balanced view of what the Sarawakian voters want. Last Friday a Lun Bawang youth Edwin Singa Pelipus was murdered by some gang in Lawas town center-this sparked off a few days of peaceful mass protest by the Lun Bawang community, wo have been fed up with rising crime in Lawas and police’s negligence about it(police are quite active againt protest by Lun Bawang eg against the Sabah Sarawak Gas Pipeline) . Most of the main stream and side stream media seems to avoid the news for whatever reason. Those that cover it try to paint it as a racial and violent prone action. 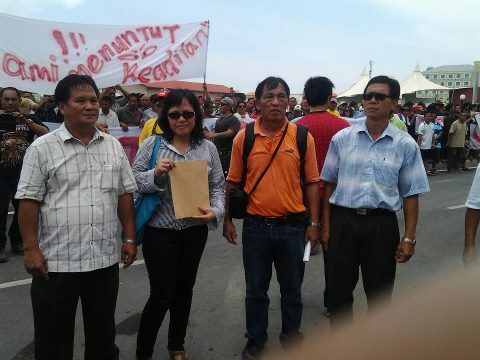 Eg Borneo Post `reported’ Malay community rally crowd to `confront’ the Lun Bawang-without a shred of evidence. Unfortunately some `neutral’ alternative media picked this up in the well practiced cut and paste `journalism’. Readers who don’t check out local reports/blogs tend to be taken in-with some even thought it would be a good idea to cover up some `ugly incidence’. The cold-blooded murder and the breach of security seems to meet a conspiracy to side-track them! Security will be a top election issue-no matter how media cover up this issue. TV Sarawak had documented a complaint of a local Lun Bawang from Long Sukang that Lawas police was negligent and even complicit in mis-handling minor foot-ball fights by students. The mistreatment of the student involved was brought to court with assistance by the local Assemblyman Baru Bian and their complaint was upheld by the court recently. The police that allow drugs and gangs to run free in Lawas is now on hot-seat to deliver justice. Don’t let the issue be side-tracked-or worse-covered up! EC want the public to look the other way from voters with `71′ on their IC! The EC is at it again-warning the public not to query its voters registration where the IC of the voters bear the code no `71′ meant to denote foreign born persons. This has been notorious due to common suspicion that the foreign born persons were given fast-track citizenship and voting rights to boost the chances of the ruling party. Such political intervention, if proven, would have defrauded the elections from the time such practices had been suspected to have cause otherwise inexplicable explosion/doubling of Sabah’s population since 1990. The EC should open their books-together with the JPN, to show that there are no hanky panky in approving these new citizens and voters rather than trying in vain to ask people to look the other way! 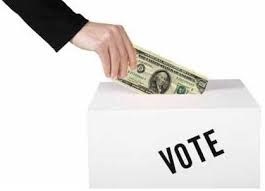 The citizens are not like civil servants who are bound to take orders from their superiors-causing them to be taken advantage of by politicians who pressure them to support these crooks politically eg attend the gatherings for these politicians where otherwise there would not be any attendants. The EC and JPN should open their books on citizens with `71′ on their ID rather than do more `look the other way’ shouting!